Home » Baking Tips » Open Sesame! Did a great variation on our classic mixed grain: inverted the bulk/retardation ferments and added a coating of sesame seeds. Boris was over at my place a few weeks back and commented on my mixed grain bread just out of the oven. I was all pleased and proud to show off, but… “Looks good mate, but its a bit dense.” What I thought was a fine crumb turned out to be crummy. The good thing about Boris is that he’s not just an armchair critic: he’s an expert that offers solutions for every problem he diagnoses. True to form, he suggested that I should try inverting the bulk fermentation and retardation. 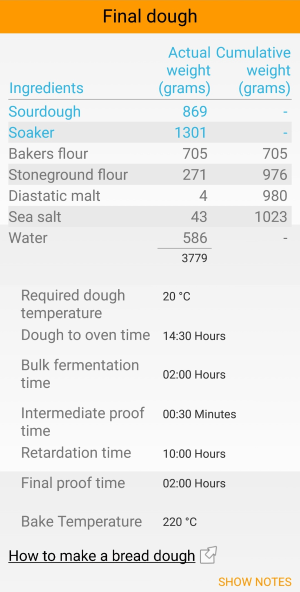 This would reduce the early acid build up during a longer bulk fermentation in the fridge and allow the gluten to form better bonding structures giving a more flexible but robust dough and subsequently more volume during baking. Next morning I removed it from the fridge for an hour before scaling and rounding for the intermediate proof (30 minutes); then molding into baskets for the final proof of 6 hours (this could vary depending on how long in the fridge – I had mine in the fridge for 13 hours). One thing I’m still learning is how to know if the dough is 45 minutes from being ready for baking (45 minutes is how long it takes to preheat my oven). The other big difference was to roll the shaped dough in sesame seeds. After molding I lightly sprayed the dough with water and then rolled it in a tray of sesame seeds. I probably could have skipped the spray of water as the dough was quite sticky coming out of the fridge cold and getting a little condensation on it. You just have to judge for yourself based on your conditions. After that they sat in the bannetons for the final proof. The results were fantastic! Great volume and lovely tasting. Of course if you don’t like sesame seeds then skip that and use poppy seeds or flax/linseed or whatever takes your fancy – I just happen to love the subtle flavor of sesame. 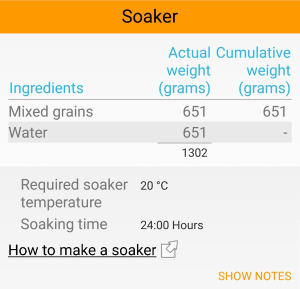 What sort of mixed grains did you use in the soaker? What were the proportions of each? I pretty much made a random mix. 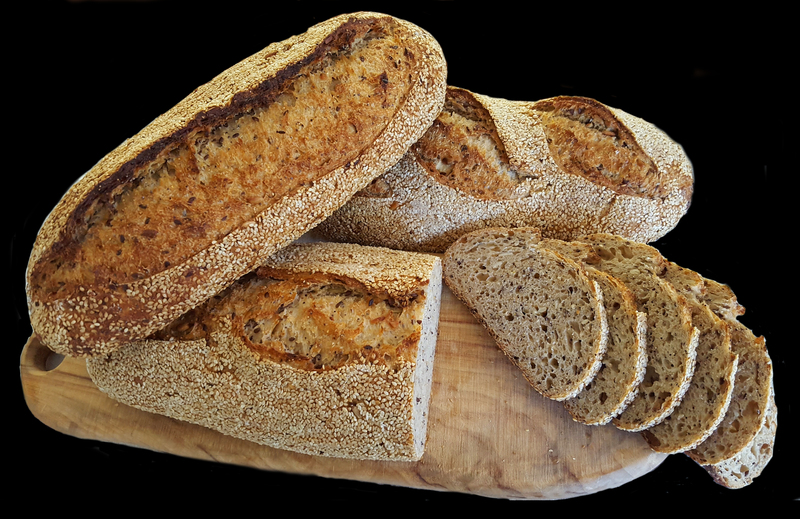 You can sometimes get a ready mix of kibble wheat, kibble rye, soy, rolled oats and polenta from either a local baker or some wholefood suppliers (depends on your location on the planet – I’m in Sydney Australia). 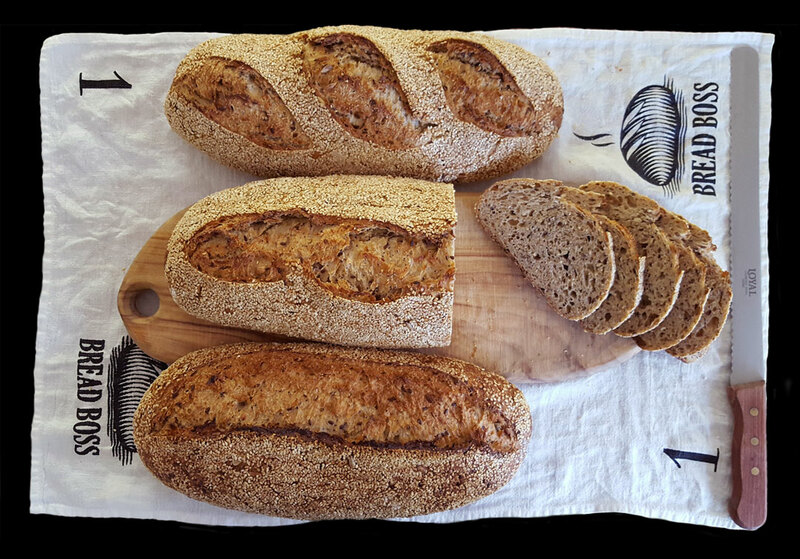 In this particular batch I used a bit of leftover mix (as above) and just added some linseed, sunflower seed, more rolled oats, more kibbled rye and wheat, poppy seeds and amaranth. I got lazy with weighing them so just added what intuitively looked right, so I can’t give proportions. 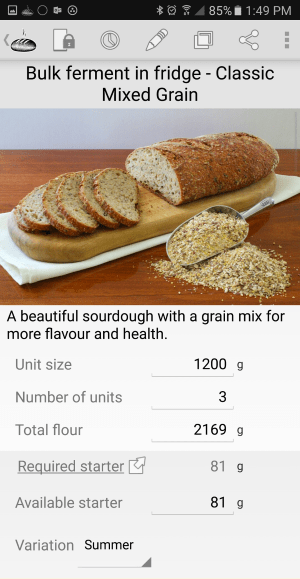 Here is a screen shot of the Bread Boss app’s recipe for Pine Nut and Mixed Seed. It gives you an idea of the proportions (note that the overall soaker is 35% in the base formula). My suggestion is that for the hard grains like rye and wheat you need about 24 hours of soaking, but the others can be more like 12 hours. 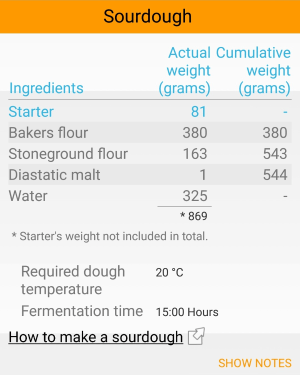 By the way, I find it useful to make a big batch of mixed grains/seeds and then I don’t need to weigh out each type when it comes to make the bread for that week – just makes life easier.